“He’s really doing it,” said Ben Mathis-Lilley in Slate.com. 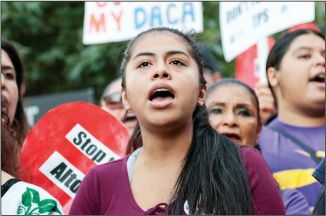 After months of indecision, President Trump this week sent out Attorney General Jeff Sessions to announce an end to the Deferred Action for Childhood Arrivals (DACA) program that had shielded nearly 800,000 children of illegal immigrants from deportation. Trump had once promised he would “show great heart” in dealing with these Dreamers, as they are called, and told them they could “rest easy.” Now he’s given Congress six months to either legalize DACA or kill it, leaving hundreds of thousands of young people—who came to the U.S. at the average age of 6—filled with fear and anxiety. What a callous betrayal, said Paul Waldman in WashingtonPost.com. The Dreamers came to this country through no fault of their own, and DACA status was granted only to those who attended high school and passed criminal background checks. Fully 97 percent are either working or still in school, and the conservative Cato Institute estimates that deporting them would reduce U.S. economic growth by $280 billion over the next 10 years. But Trump is threatening to deport them anyway, “back to lands they barely know,” as a sop to his angry nativist supporters. All Trump has done, said Jonathan Turley in TheHill.com, is “return this question to where it should have remained: Congress.” President Obama simply had no constitutional authority to grant amnesty to nearly a million illegal immigrants, let alone issue them work permits. Obama himself stressed that DACA was only a “temporary stopgap measure.” If anything, said Rich Lowry in the New York Post, Trump has taken “a giant step toward truly legalizing the Dreamers.” Many Republican leaders, including Speaker Paul Ryan, have already signaled their support for legislation pro-tecting the Dreamers, and with Trump’s sixmonth deadline now ticking down, Congress has a new incentive to act quickly. That’s nonsense, said Jennifer Rubin in WashingtonPost.com. The Republican caucus is filled with anti-immigrant hard-liners who erroneously claim Dreamers are taking away jobs from Americans. Does it really seem plausible that Republicans who can’t even pass legislation high on their agenda, such as repealing Obamacare, are about to write into law the immigration policy of a president they detested? It does not, said Dara Lind in Vox.com. “Congress’ agenda is already extremely tight for the next six months,” and because the Dreamers gave their names and addresses to the government when they applied for their permits, they could easily be deported if no legislation is passed.